Download "Revision Approved: April 11, 2015. 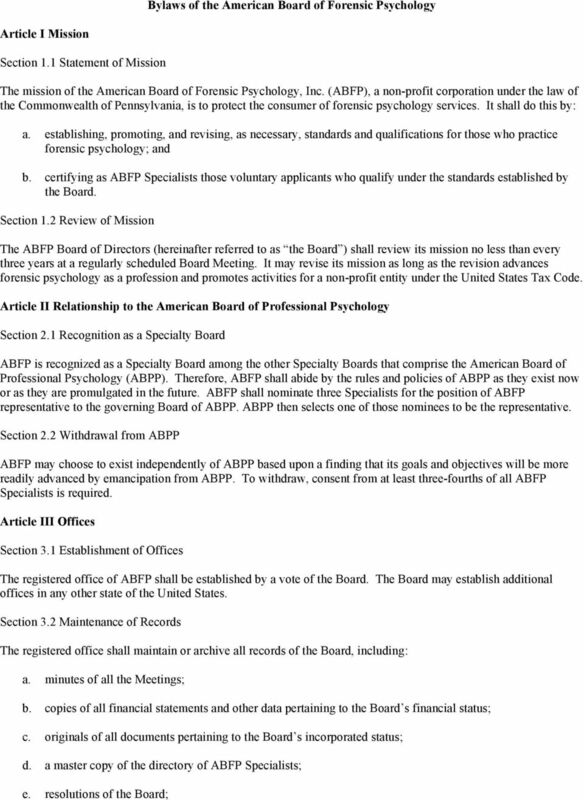 Bylaws of the American Board of Forensic Psychology"
5 f. data pertaining to the outcome of the Board s examination process for ABFP Specialists; and g. a copy of the corporate seal. Section 3.3 Records Maintained by Officers Each Officers of the Board shall make reasonable efforts to maintain records relevant to fulfill the duties of his or her office. Article IV Corporate Seal and Logos Section 4.1 Description of the Seal The corporate seal shall be circular in form and shall state: American Board of Forensic Psychology, Inc., Section 4.2 Use of Seal The seal may be used by any person authorized by the Board to conduct the Board s business. Section 4.3 Logos The Board, at its pleasure, may design a logo to represent ABFP on its promotional literature, stationery, etc. 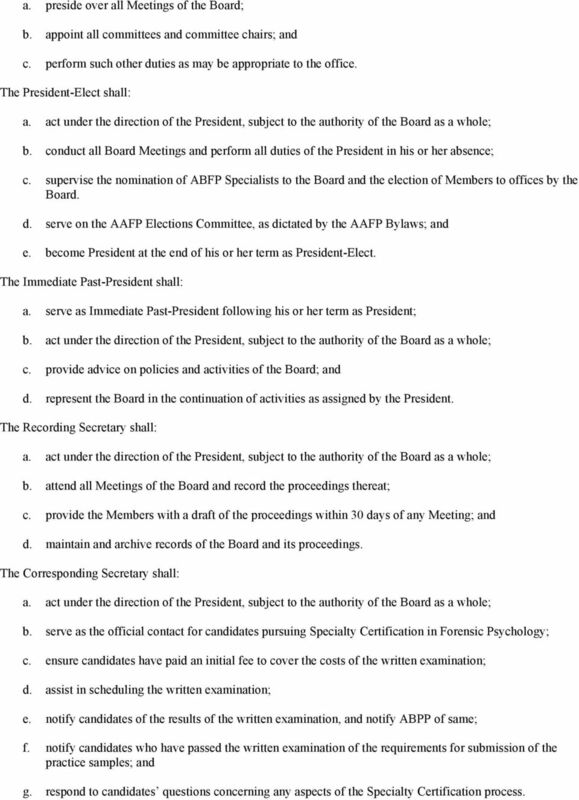 Article V Board Member Section 5.1 Composition of the Board The Board shall consist of no fewer than 9 but no more than 11 ABFP Specialists in good standing, one of whom shall be the President of the American Academy of Forensic Psychology (AAFP). 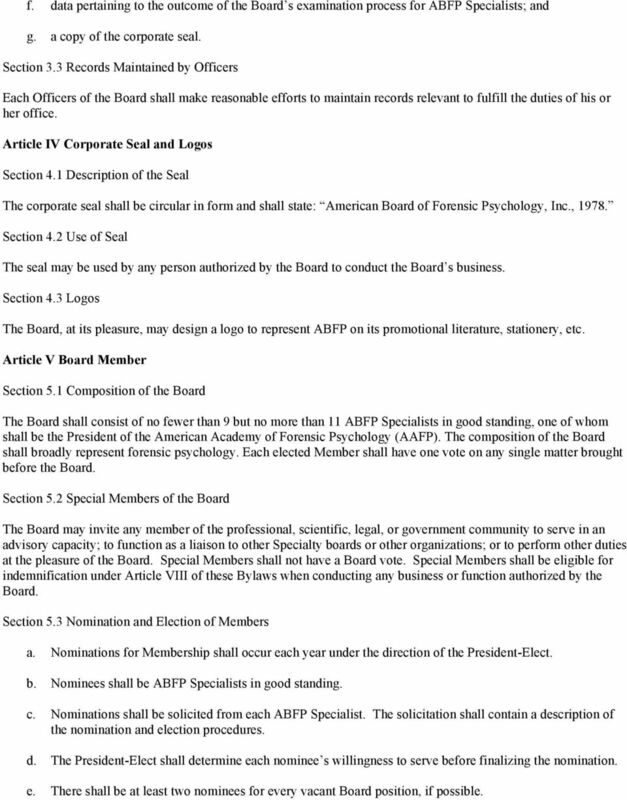 The composition of the Board shall broadly represent forensic psychology. Each elected Member shall have one vote on any single matter brought before the Board. 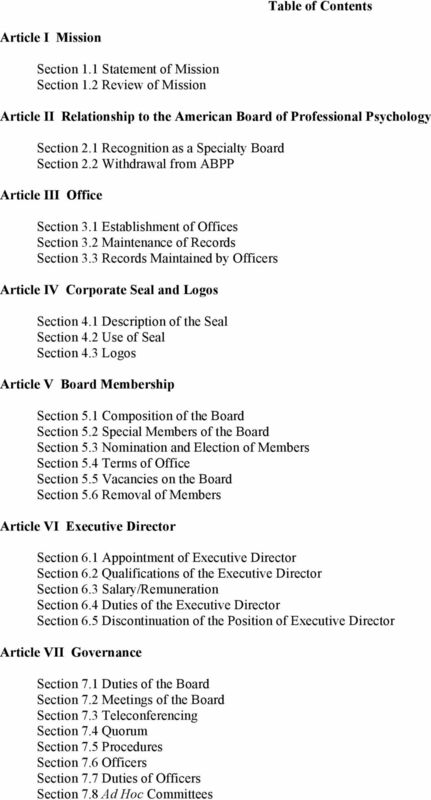 Section 5.2 Special Members of the Board The Board may invite any member of the professional, scientific, legal, or government community to serve in an advisory capacity; to function as a liaison to other Specialty boards or other organizations; or to perform other duties at the pleasure of the Board. Special Members shall not have a Board vote. 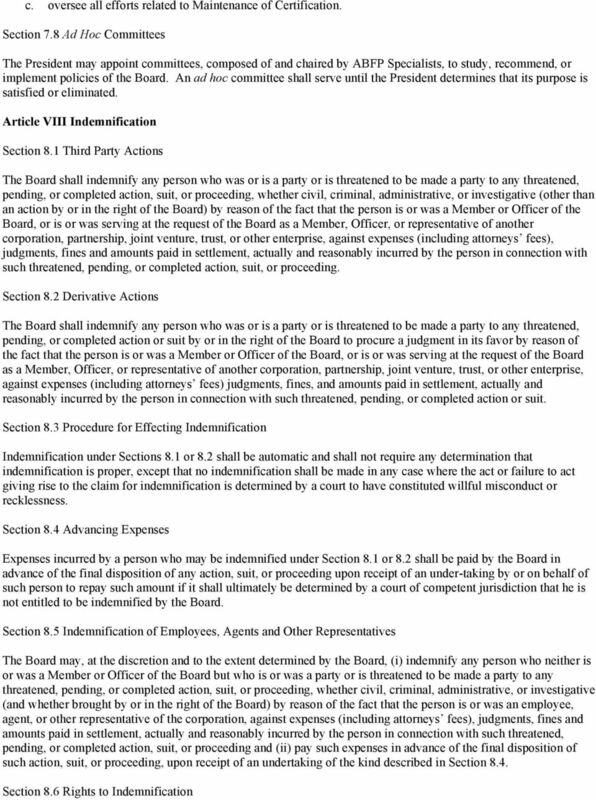 Special Members shall be eligible for indemnification under Article VIII of these Bylaws when conducting any business or function authorized by the Board. Section 5.3 Nomination and Election of Members a. Nominations for Membership shall occur each year under the direction of the President-Elect. b. Nominees shall be ABFP Specialists in good standing. c. Nominations shall be solicited from each ABFP Specialist. The solicitation shall contain a description of the nomination and election procedures. d. The President-Elect shall determine each nominee s willingness to serve before finalizing the nomination. e. There shall be at least two nominees for every vacant Board position, if possible. 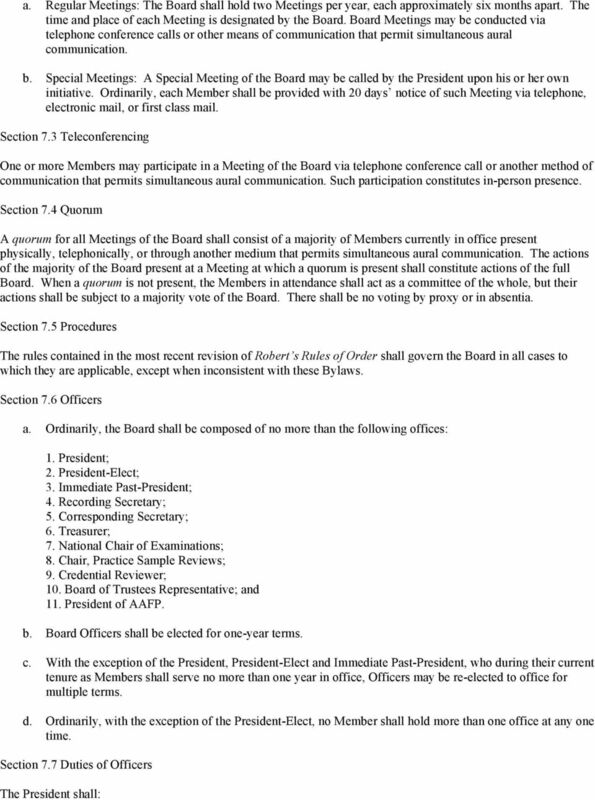 9 a. preside over all Meetings of the Board; b. appoint all committees and committee chairs; and c. perform such other duties as may be appropriate to the office. 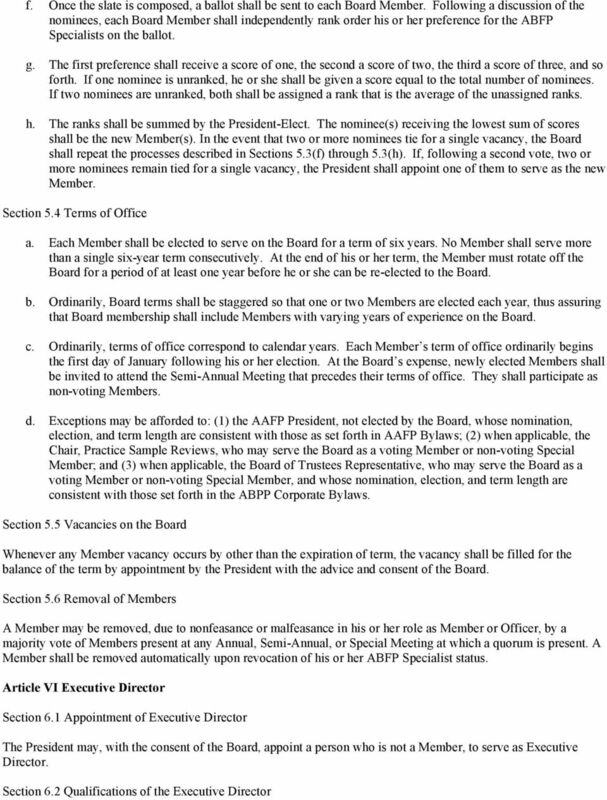 The President-Elect shall: b. conduct all Board Meetings and perform all duties of the President in his or her absence; c. supervise the nomination of ABFP Specialists to the Board and the election of Members to offices by the Board. 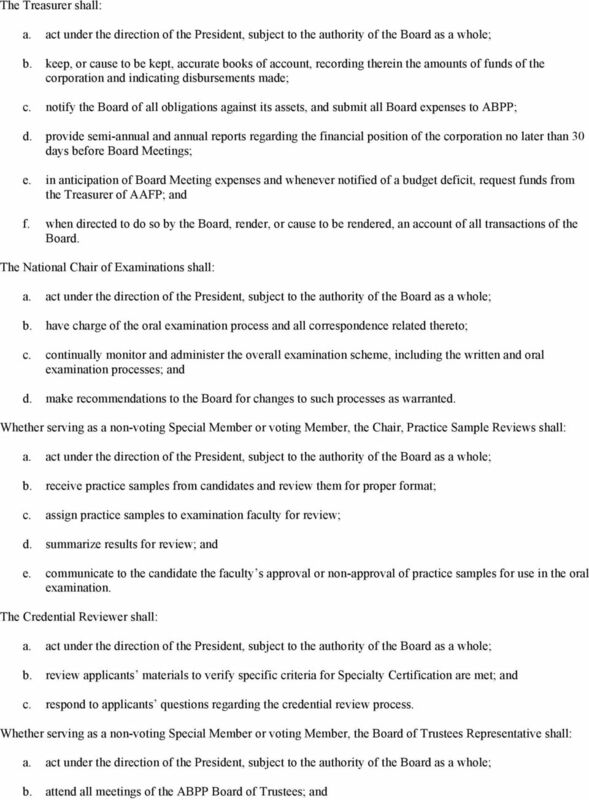 d. serve on the AAFP Elections Committee, as dictated by the AAFP Bylaws; and e. become President at the end of his or her term as President-Elect. The Immediate Past-President shall: a. serve as Immediate Past-President following his or her term as President; b. act under the direction of the President, subject to the authority of the Board as a whole; c. provide advice on policies and activities of the Board; and d. represent the Board in the continuation of activities as assigned by the President. The Recording Secretary shall: b. attend all Meetings of the Board and record the proceedings thereat; c. provide the Members with a draft of the proceedings within 30 days of any Meeting; and d. maintain and archive records of the Board and its proceedings. The Corresponding Secretary shall: b. serve as the official contact for candidates pursuing Specialty Certification in Forensic Psychology; c. ensure candidates have paid an initial fee to cover the costs of the written examination; d. assist in scheduling the written examination; e. notify candidates of the results of the written examination, and notify ABPP of same; f. notify candidates who have passed the written examination of the requirements for submission of the practice samples; and g. respond to candidates questions concerning any aspects of the Specialty Certification process. BY-LAWS OF MISSOURI ONE CALL SYSTEM, INC. 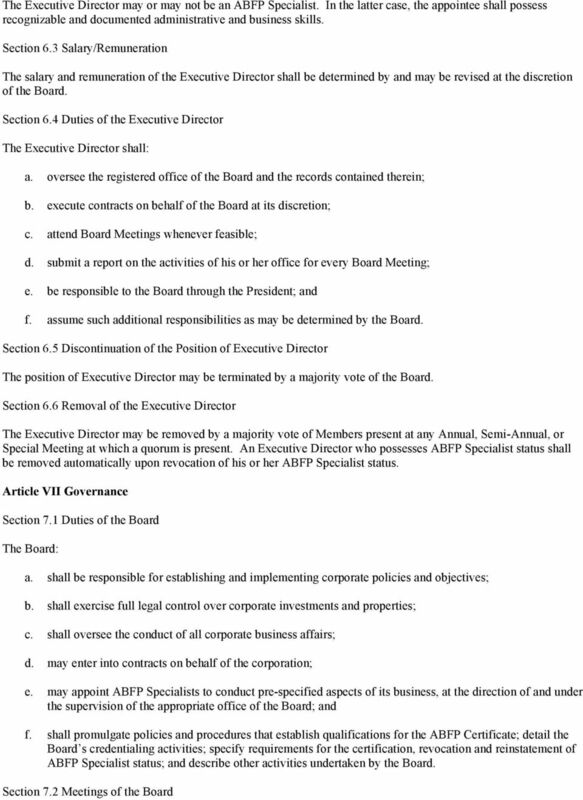 BYLAWS OF CAL STATE L.A. UNIVERSITY AUXILIARY SERVICES, INC. A CALIFORNIA NONPROFIT PUBLIC BENEFIT COPORATION ARTICLE I The name of this Corporation is Name Section 2.01. Principal Office. Cal State L.A.
(e) To assist in the advancement and improvement of pharmaceutical education. ARTICLE I. NAME Colorado Chapter (COSPRA) National School Public Relations Association By-Laws The name of this organization shall be the Colorado Chapter of the National School Public Relations Association. Bylaws of the Section of the Psychology of Black Women of the Division of Psychology of women of the American Psychological Association. BY-LAWS OF Contento Redevelopment LOC. (A Not-For-Profit Corporation) Ltd. ARTICLE 1 OFFICES The office of the Corporation shall be located in the city and state designated in the Certificate of Incorporation. 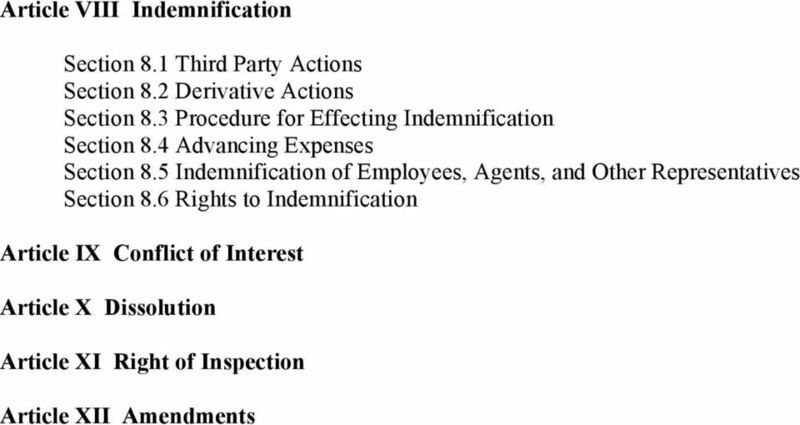 AMENDED AND RESTATED CERTIFICATE OF INCORPORATION OF GANNETT SPINCO, INC. BYLAWS OF THE PINEYWOODS COMMUNITY ACADEMY. Article I Name. The name of the organization shall be Pineywoods Community Academy (The Academy). 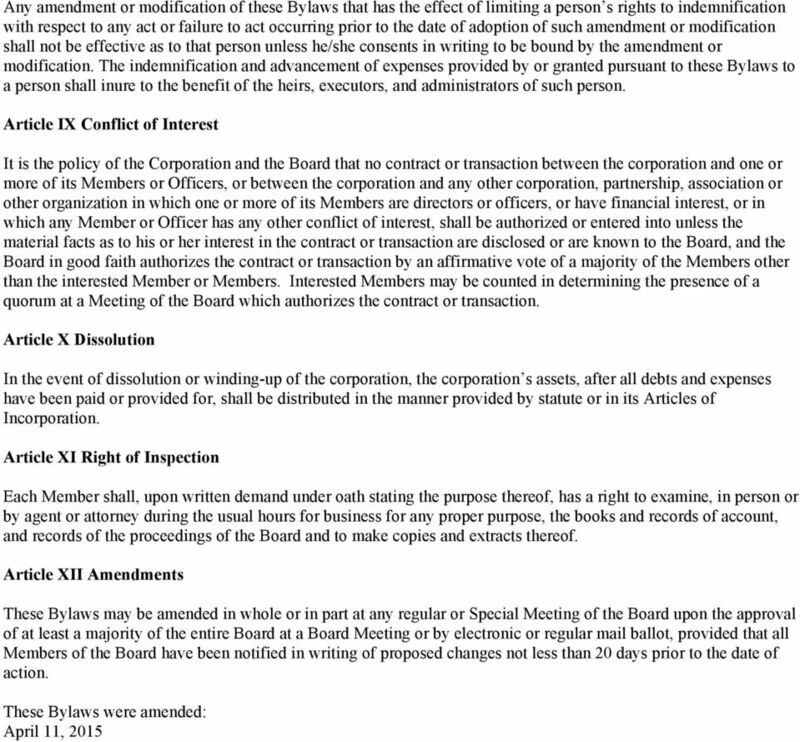 BYLAWS OF Racing Jets Incorporated ARTICLE I OFFICE AND REGISTERED AGENT Section 1. Principal Office. The principal office of Racing Jets Incorporated (RJI) shall be in the State of Nevada. Section 2. Bylaws of the Puget Sound Chapter of The Construction Specifications Institute, Inc.